1. 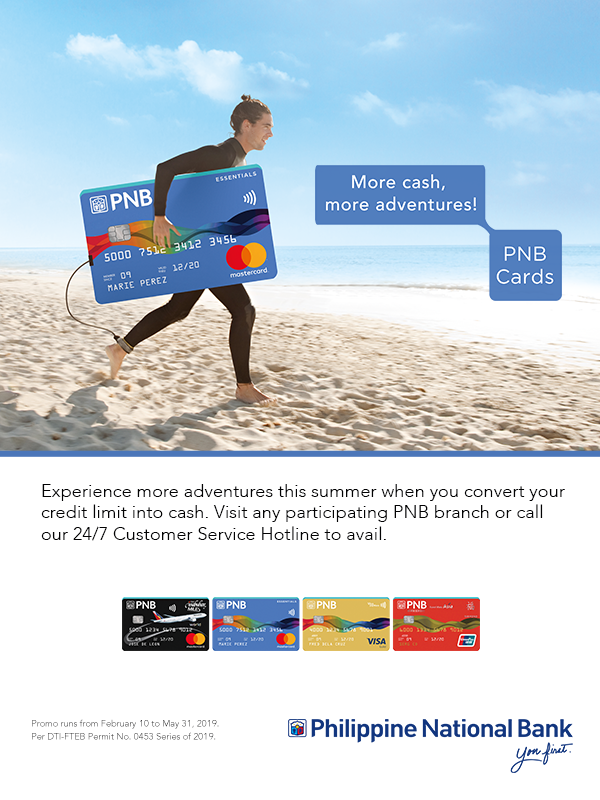 The Convert-to-Cash (C2C) promo is open to all active principal PNB-issued credit cards in good credit standing excluding Corporate and Distribution Cards. 2. Promo period is from February 10, 2019 to May 31, 2019. 3. All C2C applications are subject to PNB's credit review and approval. 5. The total installment transactions made on the PNB Credit Card inclusive of interest must not exceed cardholder's available credit limit at the time of C2C application. In case of insufficient credit limit, PNB has the sole discretion to determine and approve only a portion of the amount to be applied for. 6. To inquire about their available credit limit for conversion, cardholders may call the 24/7 Customer Service Hotline at (+632) 818 9818 or toll-free at 1 800 10 818 9818. 7. Cardholder can avail of the promo via: a. Over-the-Counter: Visit any participating PNB branch in the country to submit a completely filled out application form. Proceeds will be released in cash or credited to PNB account. b. Over-the-Phone: Call the 24/7 Customer Service Hotline at (+632) 818 9818 or toll-free at 1 800 10 818 9818. Proceeds will be credited to PNB or non-PNB account. 8. The deposit account must be solely in the name of the C2C applicant. For Credit to PNB account, the approved C2C principal amount shall be credited to the Peso Current / Savings Account specified in the application form. For Credit to non-PNB account, PNB shall issue a Manager's Cheque (MC) payable in the name of the cardholder. The MC shall be deposited to the non-PNB Peso account specified in the application form. All cheque deposits will be subject to clearing. 9. There will be a processing fee of Php 300 for every approved C2C application, to be automatically charged to the cardholder's credit card account upon posting of first monthly installment. 10. The C2C principal amount, inclusive of the applicable interest, shall be ear-marked from the cardholder's available credit limit at the time of the approval. 11. All C2C requests shall not earn rewards points. 12. In case of early termination, PNB shall impose a five percent (5%) processing fee based on the unpaid principal amount or Php 500, whichever is higher. The unpaid total amount plus the applicable fees shall be posted back as regular straight transaction. 13. The monthly installment forms part of the minimum amount due in the Statement of Account (SOA). Should the cardholder choose to pay only the minimum amount due or any amount below the total amount due, only a portion of the C2C monthly installment shall be considered paid. The unpaid portion of the monthly installment shall be subject to regular finance charges. 14. Cardholder acknowledges his/her liability to PNB for the approved C2C principal amount and interest which shall form part of his/her obligation to the Bank. 15. The terms and conditions governing issuance and use of PNB Credit Cards are incorporated herein by reference and made an integral part hereof. Per DTI-FTEB Permit No. 0453 Series of 2019.